Let's keep it real, I cringe thinking about what I was wearing to class during my first couple of years in college (I blame it on the college stress and the freshman 15). It wasn't until my last 2 years in school, when I started getting the hang of my schedule and workload, that I started to put an effort into my outfits. How to stay chic in college? UCSD is a large campus, so having a class on one side of campus and the next on the opposite end (or even worse up what we called the "treacherous hill") is common, so comfy shoes were a necessity! To top it off, I lived off campus most of my time there, and versatile outfits were key if it got cold/hot or if I needed to go elsewhere after class. True story: I wore shorts to class and it got so cold that I ended up skipping the rest of my classes to head home because I couldn't handle it (eek!) With those things in mind, I picked up these pieces at Macy's in Westfield UTC, which coincidentally happens to be down the street from my alma mater, to put together my "back to school" college outfit with a fall trends twist! 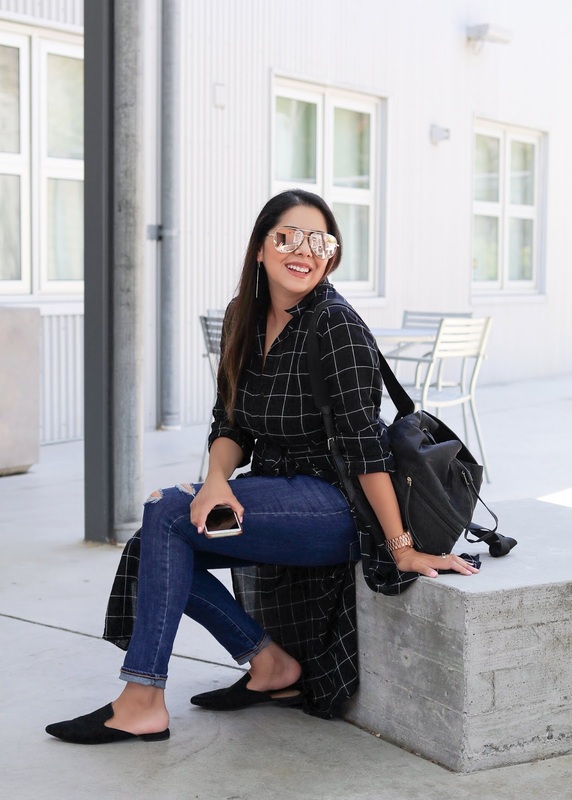 I heart emoji'd over this shirt dress when I saw it because not only is plaid in, but it can be worn either as a dress or like I did here as a flowy shirt over some distressed jeans. To keep it comfy, I went with slip-on mules that are a great way to stay comfortable and they are pretty much the closest thing to PJ slippers... we all know how college students love their PJ's, well at least some of those students who wore PJ's to class did! I also love that cool backpacks are in, and you can find several different options at Macy's from brands such as Michael Kors to DKNY! Basically Macy's is a one-stop-shop to all of the Back to School needs! And now for the event! 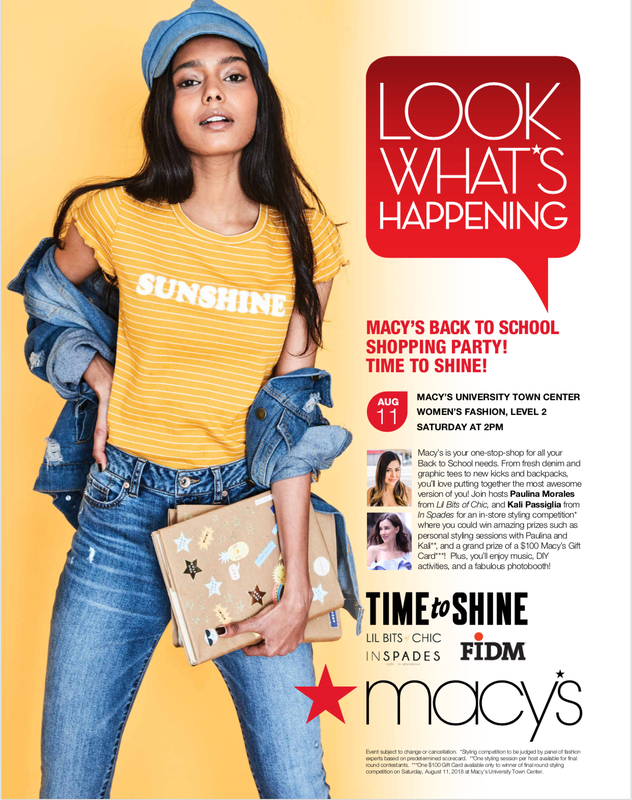 Join Kali and I on Saturday August 11, 2018 2pm at Macy's University Town Center in the Women's Fashion Level 2 for a Back to School Shopping Party! There will be an in-store styling competition with prizes such as a $100 Macy's gift card, personal styling sessions with Kali and/or myself! Plus there will be music, DIY activities, a photobooth and did we say clothes?! Also, if you are attending let me know if you're interested in competing! Hope to see you there! That shirt dress is such a great piece. I love it!